Superb dialogue propels an engaging story line. Hand-crafted artwork reveals the unique setting. Lots of decisions that impact gameplay and story. Superb music and voice acting. Game starts off somewhat slow but picks up later. Graphics stuck at 640x480 resolution. Combat can get somewhat repetitive. Game tends to be short for an RPG. Best story of any computer RPG ever, PST offers a unique setting and intriguing dialogue. 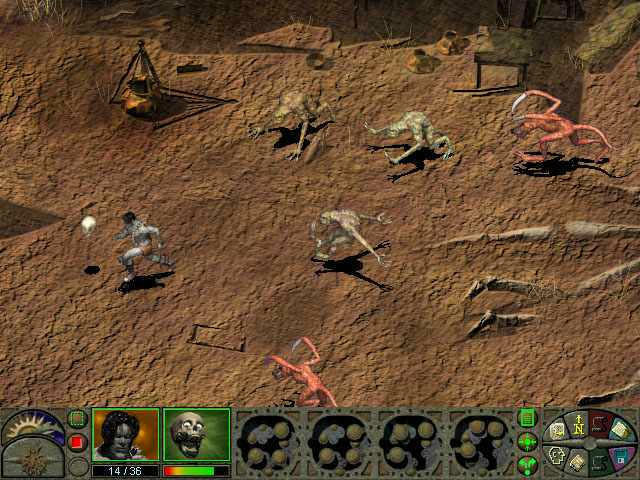 Black Isle Studios was the developer of this pinnacle of computer role-playing game. 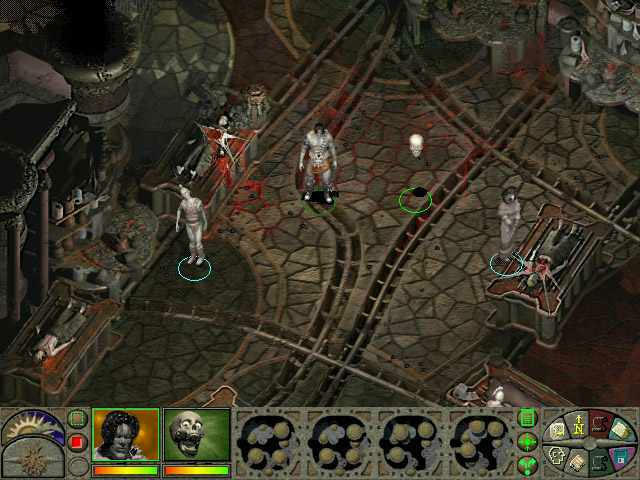 Designed by now legendary RPG developer Chris Avellone, Planescape Torment tells the story of an immortal who seeks knowledge of his past, but can that knowledge save him from his endless torment? 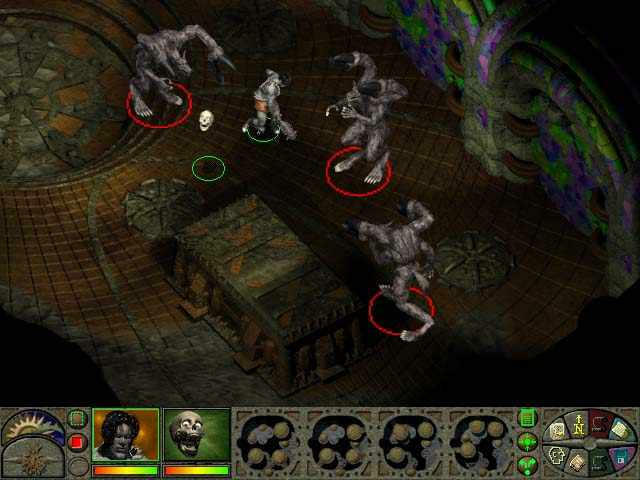 The core theme of the Planescape setting is that BELIEF is the ultimate power in the multiverse. The beliefs of the intelligent creatures (of which humans are only a minority) is what shapes the laws of each plane in the multiverse. Change enough peoples' beliefs, and you can literally change reality. Torment is a story of personal discovery set within this intriguing multiverse. The story begins with your character, an amnesiac known only as "The Nameless One" waking up in a morgue in a very strange city. Sigil is a central location in the Planescape setting, because the city has doors (called Portals) to many other planes of existence. As you play through the game, you learn more about The Nameless One's mysterious powers and past, and also a lot more about the intriguing setting itself. Character generation starts off the game as with most RPG games. Instead of rolling virtual dice as in most other D&D based RPGs, you will instead be allowed to assign points to your statistics of Strength, Dexterity, Constitution, Intelligence, Wisdom, and Charisma. This is rather important in Planescape, because the options available to you in solving problems will depend upon what scores you have in which statistics. For example, a Nameless One with a high dexterity will have options available to perform slight of hand, while a very wise Nameless One will remember his past more quickly and be able to have mind over matter in sheer acts of will. This gives the game good replay value, since playing as a wise, intelligent Nameless One will be different than playing as a strong and sturdy one. During the game, you will encounter many highly imaginative and entertaining NPC's (non-player characters). Some of these may be able to join The Nameless One on his quest of identity. You can speak to the characters in your party and unfold more of their stories, which may also help you learn more about TNO's past. The dialogue in the game is of very high quality and quantity. In fact, it's some of the best writing in any PC game since the old Infocom days of interactive fiction. The dialogue is filled with the jargon of the planes, reminiscent of 18th century London thieves' cant mixed with it's own special flavor. 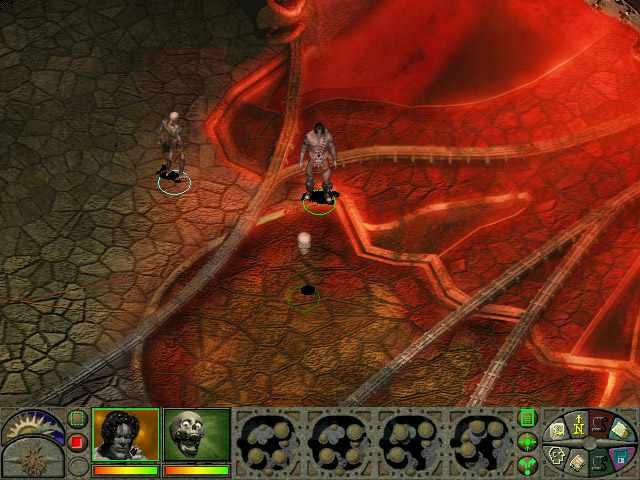 Combat is similar to Baldur's Gate, which is the engine that PST is based on. Combat is real-time with the ability to pause and give orders. Many times you can avoid combat altogether by simply running away. You get more experience points from doing quests than from combat, so it's not inconceivable to play the game as a "pacifist" and avoid almost all confrontations. Although there are a few areas you will be unable to complete without some combat. Aside from combat and story, there's a few puzzles that you must deal with which make sense with the plot and are entertaining. The combat allows for quite a few options and tactics, with special abilities of the different NPCs. Even if combat can become somewhat repetitive, the good news is that combat is, for the most part, an optional part of the game, and if you begin to get tired of it, remember that discretion is the better part of valor anyway. As in Baldur's Gate, you have a journal that keeps track of things for you. However, BIS has improved the interface for this considerably. It shows you which quests are open and which have been completed. A bestiary with some interesting 3D modeled graphics of the people and creatures of the game is also included in the journal, as well as a running journal of the story. There are also maps that are revealed as you uncover new areas, and you may annotate them with your own notes. One interesting aspect of Torment is how your character develops over the course of the game instead of all at the start. Want to be a mage? Find an NPC who can teach you how to do magic. More interested in being a knight of the post? Talk to one of the shadier characters who can teach you the arts of thievery. Alignment is also not a pre-determined, class limiting device as in other AD&D computer games. Instead, your actions and words themselves determine what alignment you end up with. Lie too often and your alignment slips to chaotic. Make vows and keep them and you'll be on your way to lawful. Kill innocents and get labeled as evil. Acts of kindness will reflect in your goodness. Your alignment will also have an affect on the paths you are able to take through the story. One of the game's few drawbacks is that the graphics are limited to the now antiquated resolution of 640x480. On larger monitors this can make things look a bit jaggy. Fortunately the game is not a 3D game, but instead uses hand-crafted 2D art which is attractive to look at even at the low resolution. The animations are excellent, the backgrounds are eerie and mood evoking. The music in Planescape: Torment is some of the best music of any game ever. The main theme haunts you as you make your way through the planes, varying depending on the mood of the situations you are in. It has deep and emotionally charged scores that jump between orchestra highs to barely audible ambient sounds of an almost alien tone. There are few games that I want to listen to the music outside of the game, but this is definitely one of them. Along with the ambient sounds provided by the background music, the quality of the sound effects themselves are very good. The voice acting ranges from very good to excellent, and Sheena Easton's performance as Annah was one of the highlights. The voices and sound effects along with the musical score all combine together to really draw you into the alien world that is Planescape. 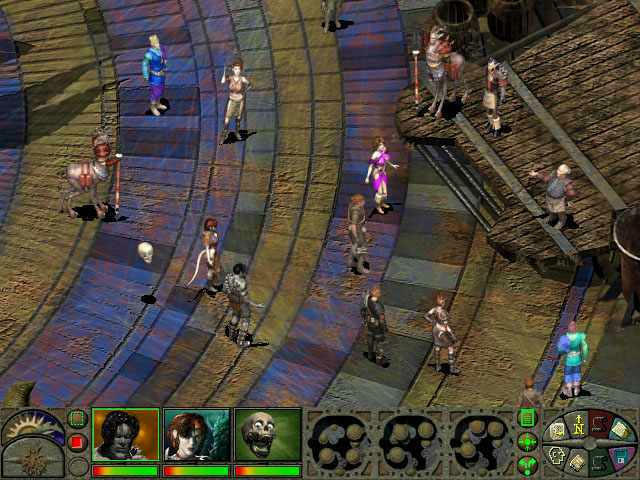 Planescape is not overly long and can be completed in 25 to 35 hours, depending on how many side quests you decide to do. Because the abilities of your character and the choices you make earlier have an impact on the story later on and change the way the story unfolds, you may find yourself restarting this game after you've finished to try different options.